If we want to get a clear understanding of heaven, then, the end of the book of Revelation is not where we should turn. Instead, we should consider the fourth and fifth chapters of the book, which we know are about heaven because John says, “This is heaven.” Let’s spend our time together this morning, then, examining John’s vision of heaven. The first thing this vision teaches us is that heaven is A PLACE OF FELLOWSHIP. Let’s read here from Revelation 4:1-6a. This shows us that heaven is the place where God and His throne are located. Most of us would assume that from the description of the glorious being in vs. 2-3, but we can identify this being even more closely with God when we realize that John is citing the description of God contained in Ezekiel 1. A little later on, John talks about the seven spirits of God, which, because seven is the number of completion, shows that God is fully present. Next, we meet 24 elders wearing crowns and sitting on thrones. Their identity is not as obvious, but Jesus gives us an important clue in Matthew 19:27-28. 12 of these 24 elders are the 12 apostles. Of course, they aren’t leaders of the physical Israel, but of the spiritual Israel—the church. Once we’ve got that filled in, we can identify the other 12 elders as the 12 patriarchs, the fathers of the physical tribes. These elders, though, aren’t significant for who they are. They’re significant for whom they represent. They show that in heaven, all of God’s people under the old and new covenants alike are going to be exalted with Him. All of this leaves us with a question, though. If God is perfect, how can He be in fellowship with His people, who are imperfect? The answer appears in the first part of v. 6, in the sea of glass like crystal. As far as I am concerned, the sea is probably the most misunderstood figure in the entire book of Revelation. Here too, we too often take our cue from all those gospel hymns that go on about the golden shore and all the rest, and we assume that the sea in heaven is a body of water like the Mediterranean. It’s actually something very different. This is temple language, not geography language. Look at 2 Chronicles 4:2, 6. In the temple, the sea was a giant basin of water that the priests used for ritual purification before they approached God. In heaven, the crystal sea is a reminder that before God’s people could approach Him, He had to purify them Himself. Fellowship is only possible through purity. Second, this text teaches us that heaven is A PLACE WHERE GOD IS GLORIFIED. Let’s keep going with Revelation 4:6b-11. Here, we meet some more inhabitants of heaven—the living creatures. As with the description of God, the description of these heavenly beings relies on the Old Testament. It’s based on the description of the seraphim in Isaiah 6 and the cherubim in Ezekiel 10. These creatures are obviously very powerful: fierce, strong, swift, and wise. However, the presence of God is so overwhelming that next to Him, they’re nothing. Around His throne, all they can do is praise His holiness, over and over and over again. The same thing is true for the 24 elders, and by extension all of God’s people. They cast their crowns before Him, which is their way of saying, “God, everything that is noble or good about us, all the credit for that belongs to You.” They acknowledge Him as the creator and sustainer of all things, worthy of all the glory that they can give Him. Sometimes, I hear people say, “If all we ever do in heaven is praise God, isn’t it going to be kind of boring?” From an earthly perspective, that question makes sense, but I think it fails to reckon with the impact of the presence of God. If heavenly beings and great men of faith are driven to their knees before His glory, how do you think we will react? We won’t have to make ourselves worship, any more than we would have to make ourselves cheer if our team won the national championship. Instead, worship will be called out of us so strongly that we couldn’t stop it even if we wanted to. Heaven will mean losing ourselves in the adoration of God. Third, heaven is A PLACE OF TRIUMPH. Look at Revelation 5:1-7. Even though this text focuses on an event that according to earthly time has already happened, I think we can learn a lot from it. It begins with a problem. There’s a scroll in heaven that represents God’s plan, but there is no one who is able to break the seals on it. In other words, there’s no one who’s suited to fill the role that God’s plan demands. However, even though John is dismayed by this news, an elder tells him not to be alarmed because the Lion of the tribe of Judah and the Root of David will be able to open the seven seals. This leads us to expect somebody impressive. Lions are impressive animals. Kings are impressive people. However, when John sees the actual champion come forward, He doesn’t look like anybody impressive at all. In fact, He looks like a butchered lamb, which is about as unimpressive as it gets! 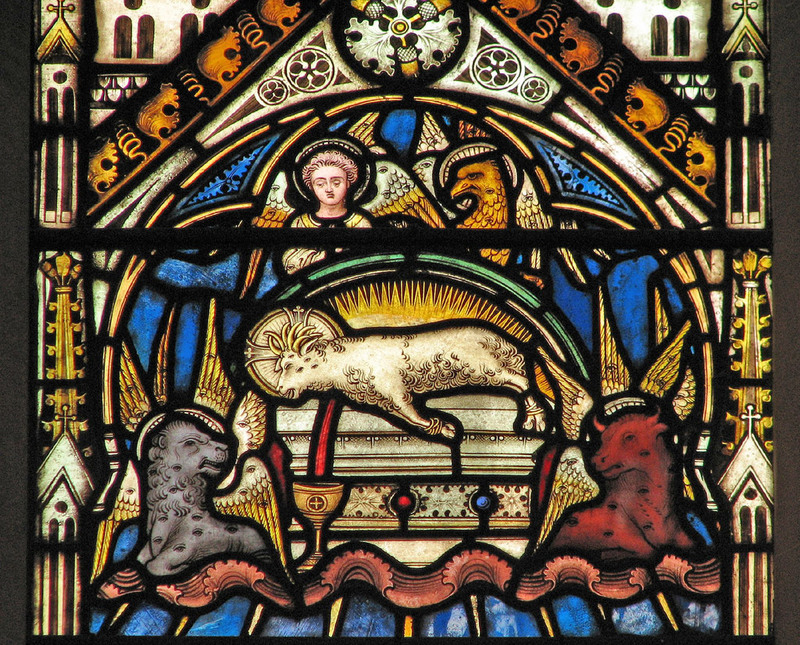 Nonetheless, the Lamb is able to take the scroll and get God’s purpose rolling. This is how God operates. Really, the story of humankind is the story of working out Jesus’ prayer that God’s will be done on earth as it is in heaven. Throughout most of human history, it has looked like God is going to be defeated. Think, for instance, of the Israelites during the time of the judges and the kings. Occasionally they were righteous, but mostly they were wicked, and these were the ones who were supposed to be holy! However, God never has been defeated, and He never will be. He accomplishes His purpose through the use of the most unlikely people imaginable. Who could have imagined that the execution of a Jewish peasant by the Romans could purchase forgiveness for God’s people for all time, and yet, in Jesus’ death on the cross, that’s exactly what happened. None of us are likely candidates to spend eternity glorified along with the Son of God, but God’s will for us will be done anyway. For us, the celebration of God’s final triumph will last forever. Finally, heaven is A PLACE WHERE CHRIST IS WORSHIPED. Look at the magnificent scene of Revelation 5:8-15. Maybe the Lamb of God doesn’t fit our preconceptions for a conquering hero, but all the inhabitants of heaven know better. They explain His worthiness to open the seals by pointing to the great victory over sin that He has already won for God’s people. The elders and the living creatures glorify Him, then all the inhabitants of heaven and everything in creation take up the song. The One who sits on the throne and the Lamb are given equal glory, glory that belongs only to deity, and we can rest assured that when we reach heaven, we will spend eternity worshiping Jesus as fully as we worship the Father. This is a wonderful picture of our future, but it can be useful to us even right now. I suspect that from time to time, probably most of you have had religious discussions with Jehovah’s Witnesses, and one of the distinctive teachings of the Jehovah’s Witnesses is that Jesus is not fully God. If pressed, they will say that they believe that He is Michael the archangel instead, a created being just as we are. However, as David Banning taught me long ago, Revelation 4-5 poses a serious problem for that claim. If you’re studying with a Jehovah’s Witness, here’s how you bring it up. You ask them to read Revelation 4 with its glorious description of the worship of God. You get them to agree that only God should be honored that way, that ceaseless worship is only appropriate when applied to deity. It’s not hard; generally they’ll go along with that. Then, you have them read Revelation 5. Point out that in Revelation 5, the Son is worshiped in the same way that the Father is worshiped in Revelation 4. Ask them, “If Jesus isn’t God, why is He being worshiped exactly as God should be worshiped?” I asked a Jehovah’s Witness that once, and she replied, “Well, you can worship somebody without worshiping them.” Obviously, I do not promise success in converting Jehovah’s Witnesses using this passage, but you can definitely get them to add you to their do-not-visit list!